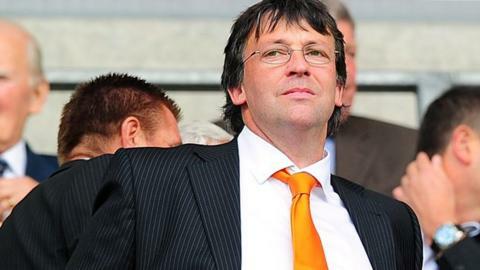 Blackpool chairman Karl Oyston has denied a Football Association charge of misconduct relating to a text message exchange with a supporter of the club. It is alleged the 47-year-old referred to Stephen Smith as a "retard". The FA asked Oyston for his observations in January and issued a formal charge in March. He has previously admitted sending the "unacceptable" texts in response to "a barrage of abuse" he received after his phone number was put on social media. Oyston has also apologised "unreservedly" for the messages, which were sent in December. During the text exchange, he is said to have used a number of swear words and also allegedly called Smith "educationally subnormal" and a "sad act". It is also claimed he told Smith to "enjoy the rest of your special needs day out". An FA statement on Thursday read: "It is alleged that the misconduct constituted five breaches of FA rules, and that during the text message exchange, Mr Oyston used abusive and/or insulting words towards a supporter of Blackpool FC. "Mr Oyston has denied the charge." Earlier this month, Championship side Blackpool became the first team from any of the top four divisions to be relegated this season. The next day, Blackpool fans threw fireworks and eggs before their 1-1 draw against Reading in a protest against the club's owners.